Winter is over and our Bewick’s swans have left to return to Russia. Unlike last autumn, when they and WWT’s Sacha Dench had to flee the harsh Arctic winter as it descended across Europe, this journey is a race to reach the wetland wilderness of their tundra breeding grounds. Sadly for Sacha, she’s had to stay behind rather than fly with the swans on their return journey, but it’s all for good reasons: Flight of the Swans created such a buzz last autumn that interest in the swans has snowballed and we’re inundated with opportunities to help them. Members of the public have been sending in sightings of Bewick’s swans as they cross Europe. Where the birds have been fitted with a plastic leg ring, this enables us to track individuals which in turn gives vital clues to the behaviour of the population as a whole. More eyes on the ground is vital in increasing the benefit of catching and ringing swans. The big surprise has been the news of thousands of Bewick’s swans and other migrating birds using a particular wetland as a stopover on migration. Until now, no one in the conservation world knew the place was so significant. It’s a real win for conservation. Unfortunately, not all sightings are happy ones. We’ve received reports from several places where people have witnessed swans colliding with power lines. The good news is that knowing about it means we can do something about it. Video footage helps strengthen the case for power companies to fit bird diverters to the lines in collision hotspots. In Lithuania, Sacha met a woman who cares for a wild Bewick’s swan every day. It can no longer migrate with its kin due to the injuries it sustained when it hit powerlines four years ago. Sacha promised her we’d do our best to stop this happening to other swans, and we are doing just that. At this site, further collisions have been prevented. We know Bewick’s swan numbers have plummeted in northern Europe, but why? Our analysis so far indicates that the problem isn’t that the swans are raising fewer young each year. At the scientific gatherings held along the flyway during Flight of the Swans, there was plenty of healthy debate on this issue and on the effects of climate change. So we’re doing something about that too. This summer we will return to the arctic for a research expedition, which will use (literally) ground-breaking techniques, taking sediment cores that will allow our researchers to build up a picture of how the tundra has changed over the last 100 years. We will take you with us on this expedition too. Watch out for live updates from the field. 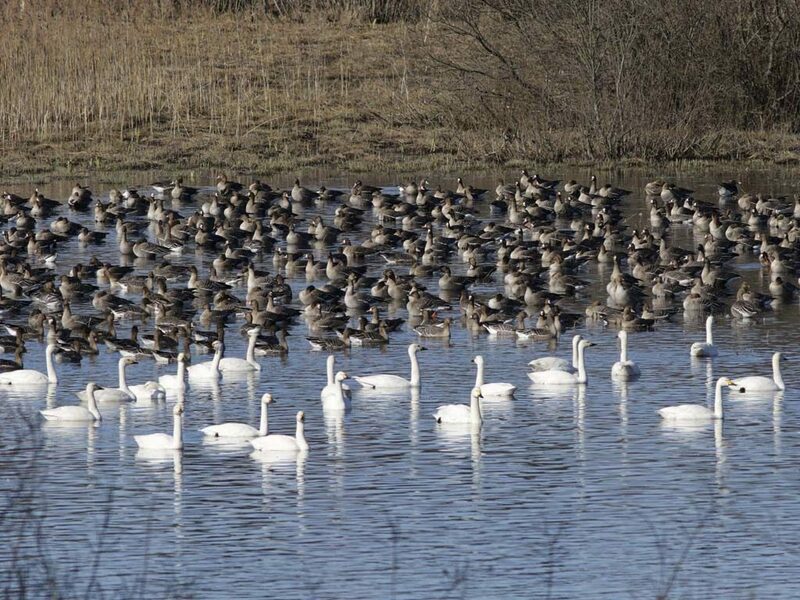 During a single week of calm south-westerly winds in early March, more than 120 Bewick’s swans set off from Slimbridge on their long journey back to Russia. WWT’s wardens were surprised to find that a cygnet, named Slightly, had been left behind by his parents. Bewick’s have strong family bonds, so we presume Slightly must have become separated during the confusion of take-off. Fortunately Slightly began his own migration just a few days later, we hope he was taken under the wing by another family, as has happened in the past. Our GPS tagged swans, Maisie, Hope, Leho and Daisy Clarke, have all made it to Russia, but a cold spell has brought thick snow, unusual this late in spring. So they and many other birds using the flyway have turned back south and west to wait for fairer weather. We’ve just heard that Flight of the Swans has been shortlisted for Campaign of the Year in the 2017 Environmental Impact Awards. Thank you for all your support.